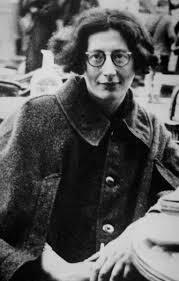 Simone Weil was born on February 3, 1909. She is remembered as a “mystic”, a social philosopher and an activist in the French resistance during World War II. She was a precocious child who, at six years of age, was quoting the French dramatic poet Jean Racine. In her youth, she gave herself to leftist causes and in 1936 joined an anarchist group in Spain. Her pacifism did not allow her to bear arms and so she served as the camp cook. While working in this capacity, she was badly scalded with boiling oil and went to Portugal to recover. Soon after this incident, Weil experienced a number of “mystical epiphanies” while kneeling in a chapel as a Gregorian plainchant was being intoned. She came to view her social concerns as “ersatz Divinity” and embraced Christianity. Although she did not enjoy the benefit of writing in a formal theological tradition, she still saw the mystery of the Triune God reflected in all of reality, especially in the geometrical theorems of the Pythagorians. In this essay, Fr. Homann presents the thought of Weil who saw many traces of Christian mysteries in the ancient Greeks’ loving exploration of reality.